Inflatable Pool Bar Just $10.97! Down From $25! You are here: Home / Great Deals / Amazon Deals / Inflatable Pool Bar Just $10.97! Down From $25! What keeps a party going is food and beverages – but they’ll get hot in the summer heat! Now you can keep them chilled with floating and portable chiller bar. This is a revolutionary product that is easy to set up! All that you have to do is inflate the bar, fill it up with ice, placed it on the ground or table or poolside–and you’re good to go! Take your soda cans, salads, ketchup, mustard–all your condiments–take them and place them in the tray! Isn’t it awesome? At Amazon, Kitchen Dreamers Inflatable Pool Bar is on sale for just $10.97 down from $24.99 PLUS FREE shipping with Amazon Prime or for orders over $35! 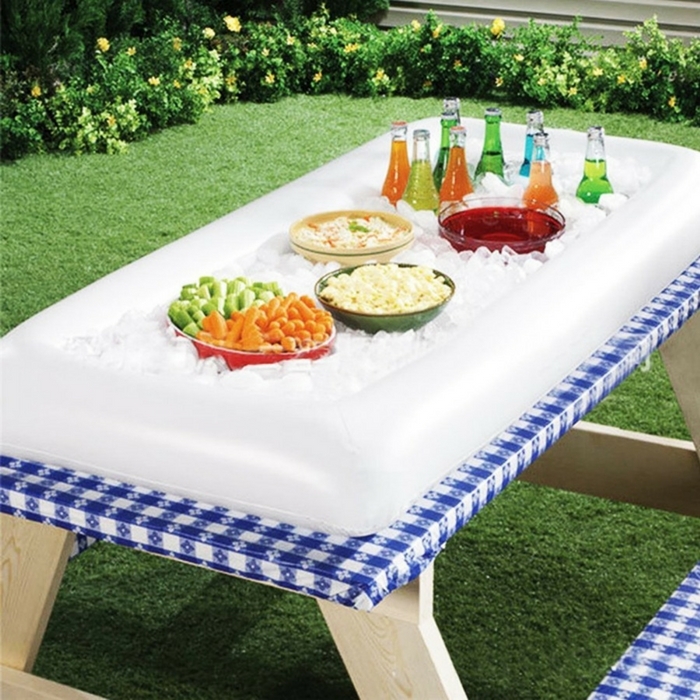 ULTIMATE BAR: Don’t keep running to your kitchen – bring the food to the party with this Kitchen Dreamers® inflatable serving bar. It can even float in your pool! ICE COLD: Dump some ice inside, and this works as a portable cooler to keep beers, soda and all beverages cold, or to keep your salad bar options cool. LARGE SIZE: Measuring at 51” long, 24” wide and 4.5” deep, this bar is big enough to hold plenty for an awesome pool party, BBQ, picnic, or a camping trip. PRACTICALITY: The handy draining spout on the bottom allows you to easily drain excess liquids or ice water in seconds. It also inflates and deflates quickly. ECO-FRIENDLY: Our floating beverage holder is made of 100% BPA-free strong PVC material. Not only is it useful, it is not harmful to the environment!